Just a week before the shuttle Discovery arrives at the International Space Station for its construction mission, a Russian resupply ship has launched to deliver a load of equipment, fuel and provisions to the orbiting science laboratory. Liftoff of the cargo freighter atop a Soyuz booster from the Baikonur Cosmodrome in Kazakhstan occurred today at 11:11 a.m. EDT (1511 GMT). A series of precise engine firings over the next three days will guide the Progress toward an automated rendezvous with the station. The docking is slated for Saturday at 12:39 p.m. EDT (1639 GMT). The 24-foot long ship will attach itself to the open port on the Pirs compartment, which was vacated Monday when a previous Progress was jettisoned. 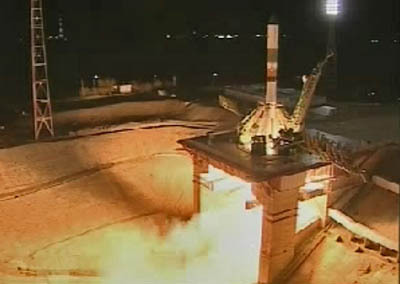 Today's launch was known in the station's assembly matrix as Progress mission 40P. The spacecraft's formal Russian designation is Progress M-08M. The craft will bring two-and-a-half tons of supplies to the station. The "dry" cargo tucked aboard the Progress amounts to 2,804 pounds in the form of food, spare parts, life support gear and experiment hardware. The refueling module carries 1,918 pounds of propellant for transfer into the Russian segment of the complex to feed the station's maneuvering thrusters. The vessel also has 498 pounds of water and 110 pounds of oxygen. It'll remain attached to the station through mid-January. The space station is staffed by the Expedition 25 crew of commander Doug Wheelock, fellow NASA astronauts Shannon Walker and Scott Kelly, and Russian cosmonauts Fyodor Yurchikhin, Alexander Kaleri and Oleg Skripochka. The cosmonauts will be standing by Saturday to take over manual control of the approaching Progress spacecraft if the autopilot experiences a problem. They will spend time this week checking out the backup system. After the Progress arrives, the station crew will turn its focus to the upcoming space shuttle mission. Discovery is scheduled to launch from Kennedy Space Center in Florida on Monday at 4:40 p.m. EDT. The shuttle will dock with the station next Wednesday to install the Permanent Multipurpose Module and an external equipment carrier. You can follow along with Discovery's launch countdown and flight in our Mission Status Center. Orbit Insertion 0/00:08:45 11:20:35 a.m.
(23.05 m/s) 0/03:37:47 2:49:37 p.m.
(8.23 m/s) 0/04:32:02 3:43:52 p.m.
(3.00 m/s) 2/01:01:48 12:13:38 p.m.
(18.089 m/s) 2/23:29:51 10:41:41 a.m.
(1.265 m/s) 2/23:51:48 11:03:38 a.m.
(22.063 m/s) 3/00:14:36 11:26:26 a.m.
(Range 80 km) 3/00:18:50 11:30:40 a.m.
Orbital sunrise 3/00:21:13 11:33:03 a.m.
(Range 15 km) 3/00:39:50 11:51:40 a.m.
(Range 9 km) 3/00:45:50 11:57:40 a.m.
(Range 3 km) 3/00:55:10 12:07:00 p.m.
(6.568 m/s) 3/00:55:31 12:07:21 p.m.
(Range 2 km) 3/00:57:30 12:09:20 p.m.
(5.282 m/s) 3/01:00:00 12:11:50 p.m.
(2.259 m/s) 3/01:02:29 12:14:19 p.m.
Start flyaround 3/01:05:38 12:17:28 p.m.
Start stationkeeping 3/01:12:50 12:24:40 p.m.
Start final approach 3/01:16:40 12:28:30 p.m.
Orbital sunset 3/01:17:31 12:29:21 p.m.